In order to demonstrate this, I will revert to two current examples: the passage of the Crystal Serenity through the Northwest Passage (NWP), on the one hand, and politics in the South China Sea (SCS), on the other. Remote as they may seem in geographical terms and as they are treated as such by area specialists, there is a wider issue at stake which connects them, centering on the peaceful use of global oceans. Currently, the Crystal Serenity is making its way through the isles of the NWP. A subsidiary of a Chinese company, the organizers are confident that they have found a viable business model and are already offering places on a similar journey for August 2017. Ongoing discussions about the potential environmental impact in pristine Arctic waters aside, the passage links to previous practices of the USA which sought to assert the status of the NWP as an international straight in the sense of the law of the sea in 1969 and 1985. Efforts to send icebreakers from one ocean to the other were met by Canadian resistance which applied both legal and administrative cunning: Canada granted permission to pass and sent accompanying icebreakers, which the US had explicitly not sought, and later enacted the Arctic Waters Pollution Prevention Act while claiming that the NWP constituted internal waters. 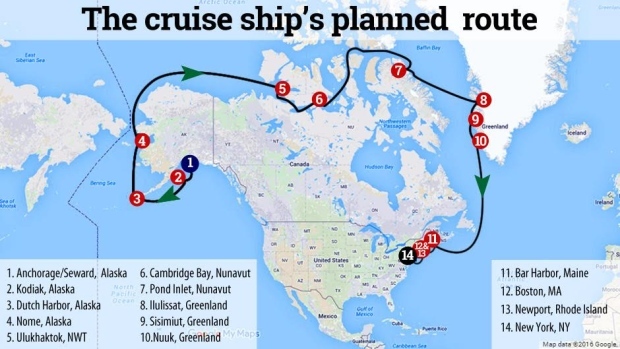 While the Crystal Serenity is not practicing what UNCLOS refers to as freedom of navigation (FON), the organisers have sought British, not Canadian icebreaking support. The voyage thus demonstrates the navigability of the passage and may begin a custom for years to come. Elsewhere the South China Sea is witnessing its own issue over access to waters. While it may be possible to portray it as the perennial mare clausum vs mare liberum issue, arguably more is at stake. Satellite images as well as reports from local fishermen evidence an increased presence of Chinese military in the region, especially in the Spratly Islands, documenting a growing infrastructure on one of the islands which provides capacity for stationing aircraft as well as boats. China is challenging the validity of a recent ruling of the Permanent Court of Arbitration which answered affirmatively concerns raised by the Philippines over Chinese claims to territory and maritime resources, which is demarcated by the so-called nine-dash line. Without the means to enforce compliance with the verdict, hopes of the Philippines and neighbouring states rest on their strongest ally, the USA. The USA has announced a shift in its naval focus in 2015, resulting in increased availability of resources and a strengthening of multilateral connections in the Pacific Ocean and East Asia rather than the Atlantic. The official position regarding the SCS is that the US is primarily interested in upholding the principle of freedom of navigation. The US Navy preserves the right by establishing custom in form of repeated passages of the SCS and neighbouring waters (and indeed around the globe) through its Freedom of Navigation operations. It thereby upholds provisions such as UNCLOS Article 87 (Freedom of the High Seas). Yet while this move may seem to strengthen UNCLOS, it may actually be bad news for Filipino fishermen and Canada alike. The practice is a confirmation of one of UNCLOS’s core articles, yet not of the wider procedural framework which it also represents. As long as the US does not ratify UNCLOS and embrace the full range of its norms and procedures, it is somehow strange to demand that the ruling of the Permanent Court of Arbitration be respected. Practices of navigational freedom in the NWP, exercised by a Chinese vessel with American tourists, and in the SCS, as emphasized by the US Navy, can ultimately be seen to undermine UNCLOS, leaving key provisions of the law of the sea subject to a pick-and-choose approach. In its pursuit of a mare liberum approach, the US appears to overlook that one of the enabling conditions of free movement of commercial vessels, cruise ships and its navy is a reliable procedural framework that offers scope for managing conflicts through which freedoms can be guaranteed in the first place. The huge achievement of UNCLOS lies in codifying a legal order that converted customary norms into a constitutional framework and in identifying ways and means to ensure ongoing debate over their meaning. It makes a difference whether one acknowledges certain principles and argues in their favour – much like John Seldon did for mare liberum – or whether one acknowledges that these are no longer subject to negotiation in principle outside a particular normative framework such as provided by UNCLOS. As a ratification seems unlikely despite widespread support the USA could revert to the Canadian case once more and strengthen UNCLOS by establishing procedural mechanisms with regard to the NWP: it might be in the States’s interest to acknowledge the NWP as Canadian internal waters after all, which would in turn strengthen the zonal concepts of UNCLOS as well as principles of navigation which matter in the SCS. Such a recognition of the NWP as internal waters of Canada could be negotiated within an agreement that would grant US access and transit privileges, while Canada would most likely be interested in a joint, coordinated effort to enforce a monitoring regime, given that it also lacks the naval capacity to do so on its own. Whatever the details of such an outcome, given that the understanding of crucial parts of UNCLOS provisions are in as much flux as the state of matter in the Arctic, it is high time to work towards achieving clarity.